When anyone talks about Peruvian cuisine, chances are they first think of Ceviche or a Pisco Sour, but thanks to Italian immigrants we have the Panettone that is more popular in Peru than in Italy, and dishes like Tallarin con Pollo, a spaghetti with chicken and tomato sauce. What makes this dish so special, is that it was traditionally the Sunday meal of the lower and middle class in Lima many years ago. This is a dish that my Grandmother cooked for my Mom, and that my Mom taught me how to cook. This is Peruvian comfort food, simple, hearty, warm, and perfect for sharing with Family. When my Mom taught me to cook this dish, it was a pleasure to watch her culinary instincts. One look at the ingredients, and she would estimate how much of each to use. I, on the other hand, insisted on measuring quantities, so that I could remember what we did. For that many tomatoes… we’ll need more stock. How about 4 of those small carrots, and only half of that red pepper. Saute the onions, add a bit of salt, pepper, more cumin and oregano. Puree everything, that’s the right color! Taste the sauce… mmm… now, let’d add the parmesan. And now, thanks to my Mom, I can share one of my favorite dishes with you — Tallarin con Pollo. In addition to the ingredients above, you’ll need a pot to brown the chicken and cook the sauce, a blender to puree the tomatoes and sautéd vegetables, and a separate pot and water to cook the pasta. Season the chicken thighs with salt and pepper and brown each piece in a pot with oil over medium to high heat, set aside. Puree a can of San Marzano tomatoes and measure 2 cups. Peel the carrots, coarsely chop the carrots, red pepper, and celery, then dice the onion and mince the garlic. Saute the onion and garlic in the same pot that was used to brown the chicken and season with salt, pepper, cumin, and oregano. Add the chopped carrot, red pepper, and celery, and continue to saute until they begin to brown slightly. Mix the sauted vegetables with the tomato puree in a blender and blend until smooth. Pour the puree back in the pot, about 3 cups. Add 3 cups of chicken stock and bring to a boil, and add the chicken thighs, a bay leaf, and cinnamon stick. Reduce to a simmer and cook partially covered until tender, or about 30 minutes, then remove the chicken thighs and set aside. Mix in the parmesan cheese to thicken the tomato sauce, and turn heat off. In a separate pot, boil water and cook enough pasta for 6 servings. Drain the pasta and in the same pot that was used to cook the pasta, mix the pasta with some of the tomato sauce. 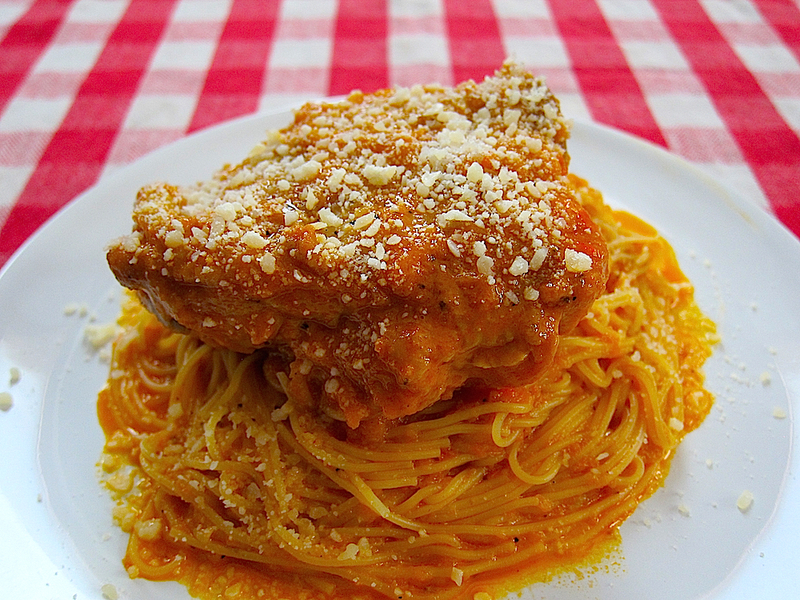 Plate the pasta with a chicken thigh on top and a scoop of the tomato sauce. Garnish with more parmesan cheese.